We are BEYOND proud and excited to announce that Kris Berzins, former Loyola University Men's Associate Head Coach, will be joining the D1 Family in a full-time role! Kris's complete bio is listed below - as you'll see he has been a prominent figure in the Chicago volleyball community over the last 10 years starting with his impressive playing career at Loyola. Kris has also been a big part of the D1 staff; running our coaches training, master coaching our Boy's gyms, and head coaching in his earlier years with the club. Most importantly, Kris has been an amazing friend to the club and is committed to the growth of youth volleyball. His take on developing athletes and dedication to providing elite training with a focus on mindfulness fits perfectly with our vision at Division1. You can click here to see a personal letter from Kris to the D1 Family - feel free to reach out to him with questions or just a quick hello at Kris@Division1vbc.com. What will Kris mean to the D1 Family? A LOT!!! Adding "Bonus" aspects to the club experience - Mental wellness seminars, nutrition advice, on-going coaches development, etc. Making the D1 Community stronger than ever! 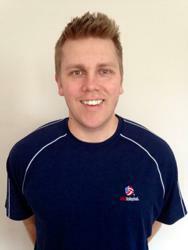 Kris will not only bring a focus and boost of energy to our training programs, he will also be working tirelessly to make all of Division1 VBC the best club environment possible. We cannot wait for everyone to meet him and know he will be a perfect fit in the D1 Family!